The SNPHN and NSLHD Frailty Initiative is piloting a new project to introduce frailty screening for older people to support early identification and develop pathways to appropriate evidence-based management. The overall aim of the project is to optimize the wellness and longevity of older people in Northern Sydney. The project will be trialled in a hospital inpatient setting, community health locations and general practice. This article is the first of a series of 3 to assist GPs, primary care nurses and other health professionals to understand some of the issues confronting healthy ageing and what they can do differently in their everyday consultations. The Intergenerational Report released in 2015 highlighted something many GPs are very familiar with. People are living longer and there are rapidly increasing numbers older people in our practice populations. The NSW population has 16% of people aged 65+. In comparison, the care of community dwelling older patients comprises a larger proportion of the workload for GPs. Encounters with patients aged 65 years or more accounted for 30% of general practice encounters (BEACH study 2013). This group is complex, with the number of medications used per person climbing after the age of 75 with at least 50% taking 8+ medications, and 30% having Chronic Kidney Disease stage 3a or worse (eGFR less than 60mls/min). Think about the issues of delivering safe and effective care to this group in your practice if CKD is not coded and identified in your prescribing software! Watch this promotional ad from France regarding frailty. What do you think if our local TV stations started playing this. Is your general practices ready for this? We should be making changes to what all do, if we are going to effectively help people age well and keep well at home. What is frailty? There are many definitions and tools – clinical, research, simple and complex, functional only vs function/ cognition. Yet another way to think about it is as a multidimensional deterioration of function in cognitive, physical, and social domains. The chronic condition known as “Frailty” occurs due to a combination of deconditioning and acute illness on a background of existing functional decline and is often under recognised. Frailty and functional decline are core factors for attendance at Emergency Departments, admission to hospital and premature entry to residential aged care facilities after an acute illness. How do you recognise “Frailty”? can slow the rate of functional decline, and frequently reverse decline if people are detected at the early frail stage. 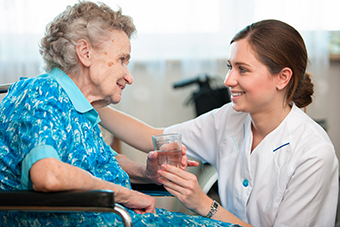 Best practice in the care of older people can be found well described in the excellent publication “Fit For Frailty”, which is a joint collaboration between the British Geriatric Society and the UK Royal College of General Practitioners. (http://www.bgs.org.uk/fit-for-frailty/resources/campaigns/fit-for-frailty/fff-headlines ) Two practice based tips which are worth adding to our consults/care plans/health assessments for anyone over 75 are the FRAIL screen, and to weigh older people at every consultation. What do you do about Frailty?